Golly! Duncan, R U OK????? OUCH. Oh My!!!! While I feel really bad right now for you...that you fell and everything...I'm laughing to cause I do the same thing...well not in the bathtub but once I feel off my bed cause I was dreaming and the twitches got me!!! It's scary...but I have to ask...how on earth did you ever get to laying on the tub!>!? Oh, my goodness, Duncan!! 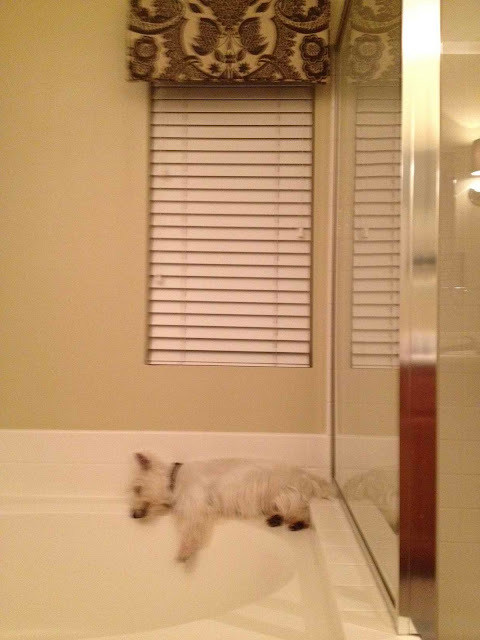 You sweet Westies do find some crazy spots to catch a few zzz's in!! Ouch!! So glad you are ok, and yep, I can just imagine that you gave the parents a bit of a scare! Tucker seems to like walking on the back of the sofa...think he likes to pretend he's on a tightrope! He loves the thrill...mommy, not so much!! Hugs!! Ok, everybody. I gotta confess. I have quite a thing for the tub. LOVE IT. I have been a "ledge dweller" ever since I was tall enough to get up there. And, I have figured out that if I start licking the faucet, I can usually get a drink. Very handy since I don't have a water bowl upstairs. Anybody got a hard hat??? ?